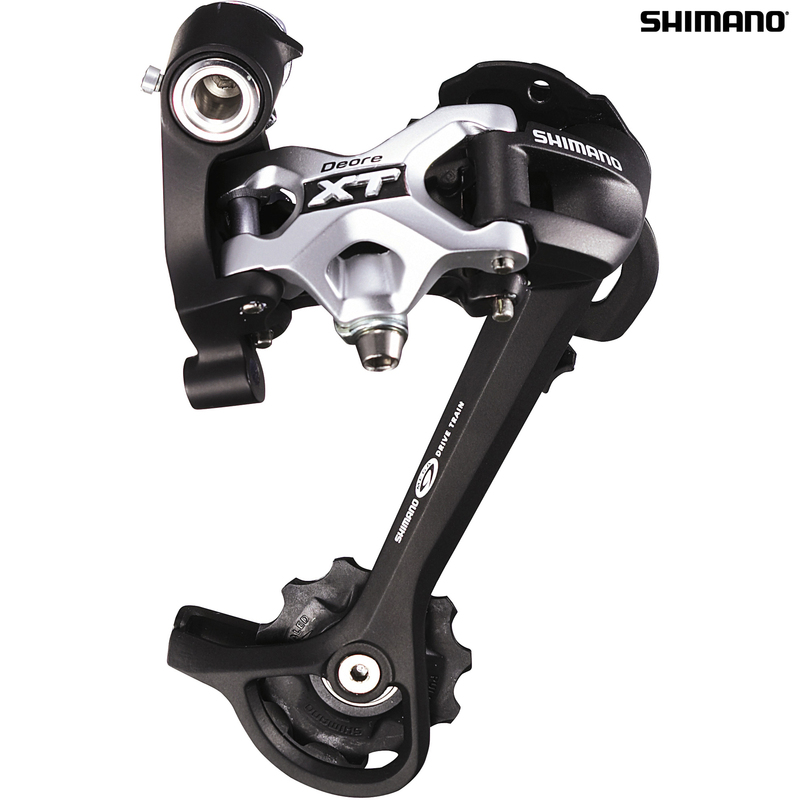 - Deore XT rear derailleur delivers reliable and precise shifting with a stiff and lightweight open design. - All-alloy construction leads to lower weight without compromising strength and durability. - Four fluorine-coated link pinbushings make this one of the slickest shifting derailleurs on the trails. - High rigidity wide outer link braces the pulley body to increase pivot joint rigidity. - Mega9 compatible for use with 9-speed drivetrains. - Durable sealed bearing tension pulley for low friction and smooth running of the drivetrain. - Top normal spring uses the spring to select higher gears, best suited to use with Rapidfire shifters. - Can be combined with Dual Control levers. - Rubber bumper reduces noise when used on non-conventional frame designs. - Weight: 239 grams SGS. Note: Mech can also be used along with Shimano Road 10-speed STI levers for a wide-range 10 speed cassette. I bought this to allow me to fit a large rear cassette to my Ultegra 10spd. Following other recommendations, I pushed the spec and got a 12-36 tooth (despite the stated maximum being 34 tooth). This resulted in the cage riding noisily on the 36-tooth sprocket, until I reversed the B-screw to give it a bit more clearance. Now, it's not bad. The shifts aren't as slick as they were before, but the indexing does work after some careful setup. No regrets, and looking forward to twiddling up the Alpe d'Huez next week! Can i use this with flat bar shifter 10sp SL-R780 ? The shimano compatibility page appears to show ST-5703 and SL-R780 falling into the same compatibility group, but i can't be sure. I have a Tiagra 4600 Triple and want to increase the ratio on the back . I therefore wanted to check that it would work . Thank you for your enquiry. You can use this rear derailleur with your Shimano Tiagra ST-4600 shifters, it should work with no problems. Aside from cost, what are the pros and cons compared to Deore M591? The overall quality of the item produced is a higher lever, the weight will generally be slightly less and in some cases you will see new features introduced at the higher levels. What is the overall capacity of this mech? Thank you for your enquiry, the Total Capacity for this derailleur is 45T. can I use this with Tiagra 4600 2x10 speed sti levers? I read everywhere about road levers no longer matching mtb rear mechs, because cable pull is now different with 10 speed, but Tiagra seems to have changed again when moving from 4600 [already 10 speed] to 4700. Is that right? 4600 and 4700 have different pull ratios, 4700 only works with 4700 to date. Will this work with Shimano M765 shifters on a 3x9? Yes that set up should work with no issues. Will Deore Xt Rd-M771 Rear Derailleur Work On A 7 Speed Freewheel (32-11)? As you are using a friction shifter you should be fine to use this derailleur on your bike. Xt M771 Long Cage, Will It Work With 36T Rear Cassette? I know it's only spec.ed to 34t by Shimano, but is anyone successfully using it with 36t without problems? These rear derailleurs should be absolutely fine being used with a 36T bottom cog on a cassette, when Shimano first brought these derailleurs out, 34T was the previous widest range cassettes so they just listed the max as that. I bought a Thorn Expedition in 2001. It had a Shimano XT M750 SGS rear derailleur fitted. It needs to be replaced and you kindly suggested the Deore XT RDM771 as being suitable. The cage on the latter is slightly longer than on the former by about 1cm. My question is, do I also need to lengthen the chain to account for that difference? I usually take a couple of links out of a standard chain in order to match the length of chain that was on the bike when I bought it with the XT M750 cage fitted. Although the new derailleur is slightly longer than the original you should not need to change the length of the chain. There is no exact science to chain length so if the length is working well now it should be fine with the new derailleur fitted. Would This Work With An Shimano 8 Speed Cassette? Looking to replace a worn STX RC 8 speed rear mech on a old style Klein MTB. Any other suitable options would be appreciated. This is a very hard one to judge, there is no definite reason as to why it wouldn't work on an 8spd system but there are a number of possible reasons that may prevent it. On top of the fact that it will be harder to set up correctly because of the different gear ratios and the gaps between the gears being greater it may also not be possible to set it up correctly at all. There is also a chance that the wider gauge 8spd chain will rub on the sides of the "cage" as it’s pulled through and when the angle changes slightly with the gears. Other than these factors which are only possible problems anyway there is no reason as to why it couldn’t work.